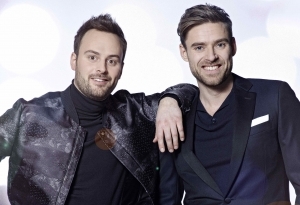 Kristian Gintberg and Johannes Nymark have been selected as the hosts for the 2019 Dansk Melodi Grand Prix by broadcasters DR. Nymark returns as host for the third successive edition of DMGP, while Gintberg has previously hosted programmes such as Ramasjang Mysteriet, Lille Nørd and Junior MGP. It is not so much about whether you work with a man or a woman, but about the energy that arises in the relationship on the stage. Annette and I fit nicely well together, and I think Kristian and I come to that as well. We already have a crazy fun together. It has been a fun development in my life first participating in DMGP and since then being the host – so far for the third time. The more you try it, the easier it goes. This means that I can relax even more in the role this year. It is the largest program DR has, and at the same time it is a tradition. It feels like a feast when there is the Grand Prix. It’s a bit like the European Football Championship – just for music. I am very proud to be the host. Lighthouse X sadly failed to qualify in 2016, their song ‘Soldiers of Love’ only managed to score 34 points in the semi final, leaving them in 17th place. The Dansk Melodi Grand Prix Grand Final will take place on February 23rd.